I’m excited about selecting my first read for 2018 but before I get ahead of myself it is time for my yearly roundup. This is always such a fun post to write because I can think back on those books that filled my hours. So let’s get into what I liked, how many books I read, and all those other fun stats. I read almost 10 more books than last year and as usual fiction and mystery are the genres where I read the most but I was happy to see quite a bit of variety and this year I even added sci-fi and essays to my reading. The only reading the challenges I completed was the R.I.P. Challenge but I may still complete the Japanese Literature Challenge as I have until the end of January for that one. While I continue to read books in translation, I didn’t read quiet as many as last year and three were Swedish translations. The reason for that was that as we went to Sweden for part of our vacation I wanted to read books set in areas I would be visiting. I read three mysteries set in Gothenburg, Stockholm and Fjallbacka which were cities we got to visit. Let’s see where we go next year. Looking forward to 2018 I would like to continue reading across genres and adding more books in translation. Thanks to World Literature Today I have no shortage of books in translation to choose from so I should be set. 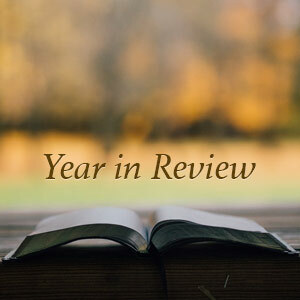 As always, I’ve enjoyed sharing another reading year with you. Thank you to everyone who makes this such a great community. My only complaint is that I end up adding too many books to my wishlist thanks to you. Ha. Upcoming, I have posts on my first book of the year and reading challenges for the new year. For now I wish you health, happiness and lots of good books in 2018. Happy New Year! You had a great reading year. Olive Kitteridge is an all-time favorite and I read (and loved) Sense and Sensibility again this year, too. Quite a few others are on my wish list. Happy 2018! Congratulations on all of the books you tucked into this year. 🙂 It does strain our satisfaction to keep finding more books that sound wonderful recommended on our favorite blogs, doesn’t it. We know we will never get around to them all, oh, do we want to! I really need to move Winter People up on my TBR pile–and Sense and Sensibility. I am about due for another Austen novel, I think. I just love Kanae Minato and Magpie Murders is one I really want to get to. I hope you have a Happy New Year, Iliana! Congrats on a great year of reading! I am attempting a few challenges in 2018, I hope I can keep track and remember to participate! I agree that I add more books to my To Read pile than I can keep up with when I read great recommendations from others! #bloggingproblems! Looks like a great assortment of books! Happy reading in 2018! It looks like you had a great reading year–even more books this year than last, too! I also loved the Kalanithi book–so hard to read but also so good. I have to note a few of your other faves for my own reading pile now. Happy New Year! Sounds like a great reading year. And congrats on reading so many books in translation; I just picked up the new issue of World Literature today. I’m sure the next stop will be the TBR notebook. Good books to you in 2018 and a good year in general! You’d a great reading year, Iliana! Now I’ve added a few books to my list thanks to your post. 🙂 It’s always fun to discover more new-to-me authors but not so fun seeing our TBR pile keeps getting higher and higher, lol. JoAnn@Lakeside Musing – I was really surprised by how much I loved Olive Kitteridge. There was so much hype with that book years ago but it was well deserved. Have a great 2018! Jenclair – I know, it’s hard to realize we won’t ever get to all of our books but knowing we will never lack for books I guess is a good consolation prize. Haha. Literary Feline – I hope you get to S&S this year. It’s so wonderful. I still haven’t gone through all the Austen books but am saving Pride & Prejudice. One day! Oh and yes, hope you read Winter People. So good and creepy! Bookworm – I think it’s especially great to look back and sometimes see that we actually read more than what we thought! Hope you’ll be able to do R.I.P. this year. Isn’t that such a fun challenge. Kay – It’s so great to see you back in blogland! Have missed your posts. Definitely stay indoors curled up with a good book this week. What is going on in Central TX right? Cori – ha, ha… blogging problems is right? Too many books but at least that is a good problem to have. Hope you enjoy your reading challenges! Kailana – Happy 2018! When are we going to see you blogging again? Missed you! Danielle – That book was tough but so moving. I remember you mentioning how much you liked it too. Here’s to a great year in reading! Lark – Thank you! Hope you also find lots of great books this year! Buried in Print – Oh isn’t that a wonderful publication? I actually have about three copies that I still haven’t gone through but boy does my list of books I want to read grow after reading that! Melody – Yay, I’m glad you added some of the titles to your list. I know, it’s great to see our TBR list just keep growing over the years right? Fantastic year! Yay for Sense and Sensibility and the Dashwoods making it to your favorites! Big Magic and Magpie Murders are high on my TBR list for 2018. Glad to hear you enjoyed them! If you enjoyed When Breath Becomes Air, you might like The Bright Hour by Nina Riggs. I devoured this memoir and plan to buy a copy for my keeper shelves (I borrowed the book from my library). Sad, but very uplifting (and funny, which is good considering the subject matter). Stefanie – Loved the Dashwoods for sure! Les in OR – Oh thank you for the tip on The Bright Hour! I hope you’ll enjoy The Dry and I am so excited it’s going to be a series. Yay! Hope you get to read some of these. Everybody seems to love Olive Kitteridge, Iliana! Guess I’ll have to check that out one of these days, esp. as its New England setting isn’t too far away from my own home. Of your stats, I’m most envious of the percentage of library books you read. I kind of work in one, and I still buy way too many books. Need to take some lessons from you on that account this year! Cheers.